The objective of this book is to present for the first time the complete algorithm for roots of the general quintic equation with enough background information to make the key ideas accessible to non-specialists and even to mathematically oriented readers who are not professional mathematicians. The book includes an initial introductory chapter on group theory and symmetry, Galois theory and Tschirnhausen transformations, and some elementary properties of elliptic function in order to make some of the key ideas more accessible to less sophisticated readers. The book also includes a discussion of the much simpler algorithms for roots of the general quadratic, cubic, and quartic equations before discussing the algorithm for the roots of the general quintic equation. A brief discussion of algorithms for roots of general equations of degrees higher than five is also included. 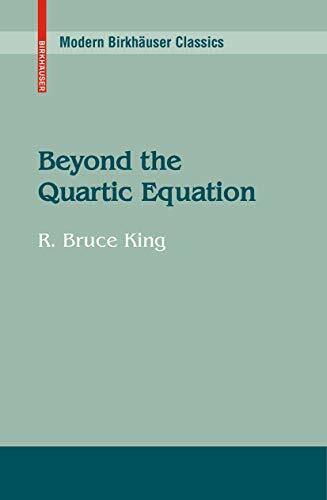 "If you want something truly unusual, try [this book] by R. Bruce King, which revives some fascinating, long-lost ideas relating elliptic functions to polynomial equations." 1. Beyond the Quartic Equation.